How fast can muscle cars go? How much are vintage muscle cars worth? You've probably seen lots of movies with high-speed car chases. You may even dream of one day driving one of those sleek, high-performance automobiles that can go from 0 to 60 miles per hour in a matter of seconds. If so, you've got your sights set on a muscle car. "Muscle car" is actually a term used to describe a wide variety of powerful, high-performance vehicles. While some people have definite opinions about what qualifies as a muscle car and what doesn't, the term usually applies to two-door, rear-wheel-drive, small to midsize cars with large, powerful eight-valve (V8) engines. Muscle cars became popular with young drivers in the mid-1960s. Not only were they sleek, attractive, and powerful, they were also affordable and able to be driven for everyday street use, as well as formal and informal drag racing. Compared to modern cars, which tend to have smaller four-valve (V4) or six-valve (V6) engines that use less fuel and are better for the environment, muscle cars tend to be smaller cars with big, oversized engines. The earliest muscle cars were not particularly fuel-efficient or environmentally friendly. Of course, fuel was cheaper in the 1960s, and science had not yet revealed many of the environmental impacts of vehicles at that time. 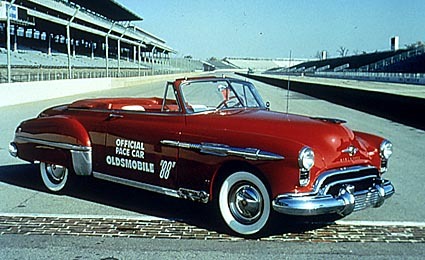 Many muscle car enthusiasts believe the 1949 Oldsmobile Rocket 88 was the first true muscle car. It boasted America's first overhead valve V8 in a relatively light body, giving it a lot of power and speed. Manufacturers began to compete, offering more powerful engines year after year. Eventually, they produced muscle cars with engines rated as high as 450 horsepower. Although the science behind the measurement of horsepower is quite complex, you can imagine how powerful an engine would have to be to equal the power of 450 horses! These speedy muscle cars could travel in excess of 120 miles per hour, which made them popular as informal drag racers. Some cars could go from 0 to 60 miles per hour in less than 10 seconds. Auto manufacturers began to tame their muscle cars in the 1970s. In response to complaints by Ralph Nader and others who wanted auto manufacturers to focus more on safety, the automotive insurance industry began to charge more for insurance on muscle cars. At the same time, gas prices began to rise, and efforts were under way to fight air pollution. All of these factors led to the decline of the muscle car in the 1970s. Auto manufacturers concentrated their efforts on lowering horsepower, increasing luxury, improving fuel economy, and reducing emissions. Today, auto manufacturers still make powerful models that appeal to racing enthusiasts. For the most part, though, these models aren't as affordable as the muscle cars of old. Classic muscle cars, such as the Dodge Charger R/T, Ford Mustang, Plymouth GTX, and Pontiac GTO, have become collector's items for muscle car enthusiasts. Some of these old models are relatively rare today and have been valued at up to $500,000. Extremely rare models, like the 1969 Chevrolet Camaro ZL1, are seen as museum-worthy artifacts! We believe you’ll think tomorrow’s Wonder of the Day is the cat’s meow! Want to see some muscle cars? Jump online and browse through the pictures in the American Muscle Cars photo gallery. Which one is your favorite? Why? Ready to try your hand at designing your own muscle car and then racing it in a fun online video game? If so, it's time to play "The Fast and the Phineas!" Choose from a variety of wheels, chassis colors, engines and body kits to create your own custom ride. When you're done, you can print a picture of your creation before trying it out on the road. For the artists among you, grab some crayons, markers or colored pencils and learn to draw your own custom muscle car. What color car would you like to drive? Would it have flames down its sides? Is the engine so big it has to poke out the top of the hood? What custom wheel design might be lurking in the back of your imagination? A 4-Stroke V8 Engine should have at least 16 Valves (2 Per cylinder) One being intake and the other being Exhaust. Also, the Mustang is a pony car. Thanks for sharing this information, Mathew! It sounds like you have a lot of knowledge about muscle cars! well if you ask me you should make one about the challenger demon or hellcat. They are one of the most quickest street car in the united states. My dad has a 2017 Challenger it is AWSOME!!!! That's awesome, Cameron!! What is your favorite part about the car? In addition to the pictures, this Wonder is an article to help us learn more about muscle cars! We're sorry you feel that way (and sorry we can't get you an actual car!) but we have plenty of Wonders for you to check out!! We're glad you're our Wonder Friend, kiara! fix the reading to your self it only reads the top not the hole thing. Hmmm, maybe try opening this Wonder in a different browser or device? If it still doesn't work, let us know!! Thanks for WONDERing with us!! Oh it isn't? Why did it change? well this is what I found on the internet "The Ford Mustang Is No Longer A Muscle Car. For 50 years, the Ford Mustang has been the iconic American car. ... Honestly, Ford's new sixth-generation Mustang GT is nothing short of a revelation. It drives like a world-class sports car — not, dare I say it, like a Mustang." so I guess it is not a muscle car. Thanks for sharing this information with us, Cole! Glad you liked it, Cole! Do you have a favorite muscle car? Yes I a ford mustang If it is a muscle car. Very cool!! You might find Wonder 1700: How Fast Is the Fastest Car? interesting, too!! make one about HYPER CARS!!!!!!!!!!!!!!!!!!!!!!!!!!!!!!!!!!!!!!!!!!!!!!!!!!!!!!!!!!!!!!!!!!!!!!!!!!!!!!!!!!!!!!!!!!!!!!!! Thanks for the suggestion! Have you submitted it to our Wonder Bank? 😎 What's one of your favorites? Thanks for the suggestions, Greninja! Sounds like you are pretty interested in this topics. We encourage you to go on a little Wonder Journey to find out more about muscle cars. Have fun WONDERing! That's awesome, Caleb! But easy on the shouting, bro (take the caps lock button off). If you're curious as to why, check out this past Wonder, Wonder#670: Do You Have Good Netiquette? We are super glad that you are WONDERing with us, though, Caleb! Comment again soon! i have a nice muscle car it is really old!!!! I think the 1953 corvette was one of the first muscle cars. The oldsmoble looks a bit like an antique convertible. My favorite muscle car is a corvette stingray 1963. They look pretty awesome. Thanks for joining us at Wonderopolis, car lover20! 😂 Good reference, Caleb! 1.21 gigawatts?! i like dodge charger daytonas and ford jailbars. I wish there was a quiz. I think this story is pretty good, but I don't understand why gas went up and the number of muscle cars started to go down because of their palliation. I love cars do you because I'm a car guy. Awesome me and my dad love all types of cars. I have always wondered exacly what classIfied a muscle car as a muscle car. Great information, but I believe there is an error in the fourth paragraph after "Did You Know?" "... to have smaller four-valve (V4) or six-valve (V6) engines..." should probably read "four or six *cylinder* engines..."
I go to a car show 4 times a month and every year I go to the one in Morro Bay. The engines are not called v8s and v6s because they have 8 or 6 valves. They are called v8s and v6s because of the way they are built. The cylinders are lined up diagonally with either 3 or 4 pistons on each side driving a common crankshaft. There are also inline fours, sixes and eights, where all the cylinders are in a straight line driving the same crankshaft. V4s are never made for cars only for motorcycles and outboard motors for boats. That is exactly what I thought when I was reading this article. But Saab and Ford Used V4 Engines In some of their models at one point. Great wonder today!! My two boys love collecting model cars and are into muscle cars. They will be happy to know what was the first true muscle car! Thank u, it was nice to learn something to share with my boys. A powerful, high performance vehicle if often known as a what? Muscle car engines usually have how many valves? Which of the following models is NOT a classic muscle car? aDodge Charger R/T Not Quite!